This winter has been a particularly odd one for weather and conditions. 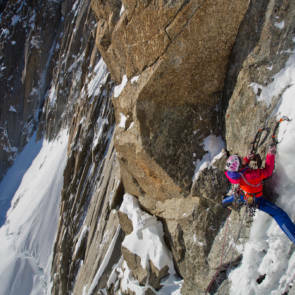 It’s been a battle at times to get partners and climbs done but I’d set out three big projects in my mind: the Lesueur route on the Drus, something on the South Side of Mont Blanc, and something hard on the Jorasses. The first two got dispatched but the Jorasses was going to be a hard one- the combination of finding partners and a 5 day weather window were starting to slip away. In addition the Jorasses is in terrible nick right now so it really only boiled down to one of two routes- Manitua, or Rolling Stones, both hard multi day aid routes. Aid climbing is something I really know nothing about, and this was a slight problem. My usual partner in (Jorasses) crime, Will Sim, was back in town but we still needed a third person and that person had to be an aid monkey to make up for our total lack on knowledge on the matter. American guide Geoff Unger stepped in and suddenly we were a ‘go’. The day before we quickly headed to Le Fayet for some ‘101 Aid Lessons’, and then a shop and pack for the coming days. The route of Manitua goes right up the blankest piece of rock on the face- the shield of rock that forms the middle part of the Croz Spur. 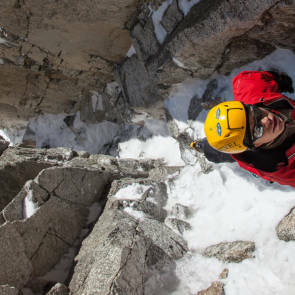 It’s an awesomely steep and exposed area of the Jorasses and has only had a handful of winter ascents to date. Will and I had actually climbed quite alot of this route as it shares the same start of No Siesta and finishes on the Croz Spur but we’d never been on the shield before. In short we would be spending 4 day on the face with difficulties of 6c/ A3 and plenty of delicate but easy angled ice terrain. The walk in was long. We had aimed to get to the start of the aid climbing on our first day which meant skiing into the Jorasses and climbing some 300m of mixed ground in one day- a big task given that it’s winter and that we had huge packs on our backs, so we were glad when we finally arrived at a decent bivy just before sunset. We had no idea how long the aid sections were going to take us. It wasnt something that we had any experience of. Heading over to the base from the bivy actually took us quite a while as conditions were very thin- lots of black ice and loose rock made for poor pro and slow going. But we finally got to the base of the first aid pitch and Geoff took over. I had intended to lead all of the first day but seeing as it took us a lot longer to get to the start and that we didnt have a portaledge it felt wise to not waste any time and try and motor up to the next bivouac before it got dark. Geoff headed off and it quickly became clear that there was a huge amount of technique that I just didn’t know, and hadn’t been able to pick up in our Aid Crash Course two days previously. Watching him head up the rock I realised that there just wasnt any point in me trying to aid anything- I just wasn’t going to be fast enough, and this is winter alpine terrain where speed counts for everything. So Geoff cruised on up and we arrived with daylight to spare at the next bivouac. Geoff proceeded to fix the next whopping 60m pitch whilst Will belayed him and I started to dig out our accommodation. The bivouac was pretty amazing really- we were half way up this incredibly steep and imposing bit of rock yet somehow there is this perfect off-width bivouac right there on the route. It’s a tight squeeze (literally shoulder width apart) but once you’ve cleared the snow there is just enough space for three of you to lie down head to toe. It wasn’t the best experience and cooking in such a confinement was a pain but at least we could all lie down. 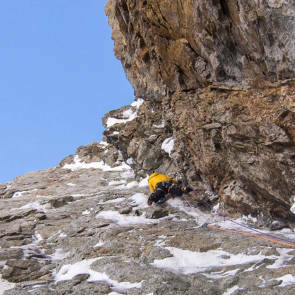 Geoff came down in the dark having fixed the following pitch and was looking understandably a bit shattered. The following morning dawned and saw us jumaring up the fixed lines. A 60 meter free hanging jumar always helps wake you up in the morning- not least for Geoff who discovered a core shot in the rope when he got to the top. The kind of discovery that makes you feel quite sick inside. Will lead off on a big traversing rock pitch which totally wiped me out following with jumars and the heavier pack, and it was onto the final headwall. Geoff, aid hero, took over again. As a side note I occasionally take a shot that I think is above and beyond and this, for me, was one of them. I was jumaring up on the single rope and had to tie myself off, take off the seconds pack (75L) taking extreme care not to drop it, then remove my camera from the top without dropping anything to snap these shots. Might sound easy but as far as putting ‘effort’ into getting a shot this is one of my top ones. It’s one of those moments where it’s just so much easier to just ignore the shot and keep jumaring up. The terrain now got pretty serious. It steepened up a huge amount, the exposure was nuts, and the pitches often traversed around. Thankfully all the aiding landed on Geoff who ploughed on through headstrong and solid- never complaining about having to lead or saying his was tired even though you could see by the end that he was shattered. Seconding with a pack was an interesting experience though and scary at times- jumaring on a single rope when you’re on traverses is pretty scary stuff and I found myself gripped out of my mind at times to try and minimise any swings. 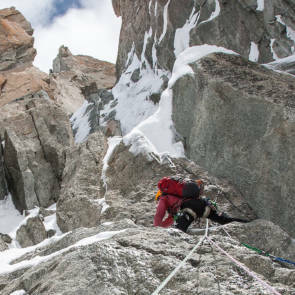 I would arrive at the belays pretty shattered and scared so I can only imagine what it was all like on the lead. The following pitch was another interesting one and Geoff fired on up with a mixture of free and aid moves until the final pitch reared its head. The final pitch is the A3+ one. A grade that I dont really understand and I was glad that the aid monkey was keen to have a crack at. It started off nice enough until it reared up incredibly steep and exposed at the end. The sting in the tail was exactly that- a few incredibly hard and desperate moves right at the end. Watching Geoff try and transition from a tiny knifeblade and on to a slab in mountain boots was terrifying to say the least. After a few goes he made it though, and with fixed lines attached we were finally getting off the wall. Amazing effort by Geoff, it looked terrifying; I was sure he was going to take the huge whipper more than a few times. Long belays by this point! Up onto the Croz Ice field and we made it over to the Boulder bivouac where we settled in for the night. Day 4 on the face and it was time to get off the thing. Bags packed and we headed up the rest of the Croz Spur which was horribly dry. The original line to exit Manitua actually heads off to the side of the Croz Spur but given how loose the rock is up there and how dry conditions were it seemed like a much better and safer idea to head up the normal route. Plenty of black ice and loose rock took us to the Breche. From here on it was alot of thin placage and loose rock until the last few pitches where things got interesting again. Those who’ve done the Croz will know how loose those last few pitches can be and I was terrified of pulling something huge off and cutting my rope- it was probably also a tired mind that didnt help the lead psyche but in any case we kept making progress. Will took over for the last pitch to the top but deemed it too dangerous and so we took a variation around the side and finally topped out in the sunshine. Last few steps to the summit…but most importantly….sunshine!!! The descent was not ideal down the south side. The Reposoir was covered in deep sugar snow which made the going really dangerous at times. A backpack was also dropped which happened to contain pretty much all my rack, my spare memory cards and mics, the sleeping bags, Geoff and Will’s cameras, and a ton of other stuff…so if anyone wants to donate, now would be a good time! It made for a lighter descent but we’d also lost all the food and gas so it was with huge relief that we found both gas and food in the hut and finally hunkered down for a well deserved meal and sleep. Manitua was an awesome experience and I was really happy to finish off my winter ‘projects’. A huge welldone to Geoff for dragging us up the shield.